The Web has transformed how we buy stuff. One brand that has come to the fore in the internet age is Nottingham-based Alpkit, who set out to design, make and source great outdoor products, then sell direct to the customer. Alpkit’s approach has reduced the price of its gear; but the company also directs its attention to key items that fill a niche in the market. The result is an ever-changing range of products that are available for short periods then either continue to be available or are dropped, depending on sales. This means users need to buy promptly while products are in stock to avoid disappointment. But if you get in early you can expect low price tags and, most importantly, great design. Alpkit’s latest tent is the 2016 version of the Ordos 2; it was listed as ‘pre-order only’ until stock arrived in early July but is now available online from the website. The tent has been tweaked for 2016 with a 3000mm hydrostatic head, more guy lines, less mesh on the inner and the option to pitch it flysheet-only, so it’s virtually a completely new design. All that for £195 sounds great; but it sounds even better when you consider it weighs only 1335g. In the June 2016 issue of Trail, we reviewed two-person tents with price tags from £390-600+ that weighed 917g to 1971g, so the Ordos is a tent we just cannot ignore at this price and weight. In normal use it pitches inner-first with a skeleton of poles forming a frame from which the inner is suspended. The flysheet then goes over the top with ladder-lock adjustment, some great pegs and plenty of guy lines to ensure this is not only very quick and easy to pitch but it’s also very stable. The front entrance zip has only one zip, so you cannot open it from the top, which is a minor niggle; and it only opens to one side, while some higher-priced tents do have more elaborate doors. But the porch can take a couple of rucksacks; however some pricier tents have larger porches and even twin entrances, so there is some compromise here. The inner tent is wide and spacious, though, and it has good space at the foot area due to the external frame design at this end to the tent. Two campers can sit up pretty easily inside too. It is only 208cm long however, which is a little short as most tents are 225cm long. As a purist I’d prefer an outer-pitched-first design, and double zip pulls would be nice on the outer doors. 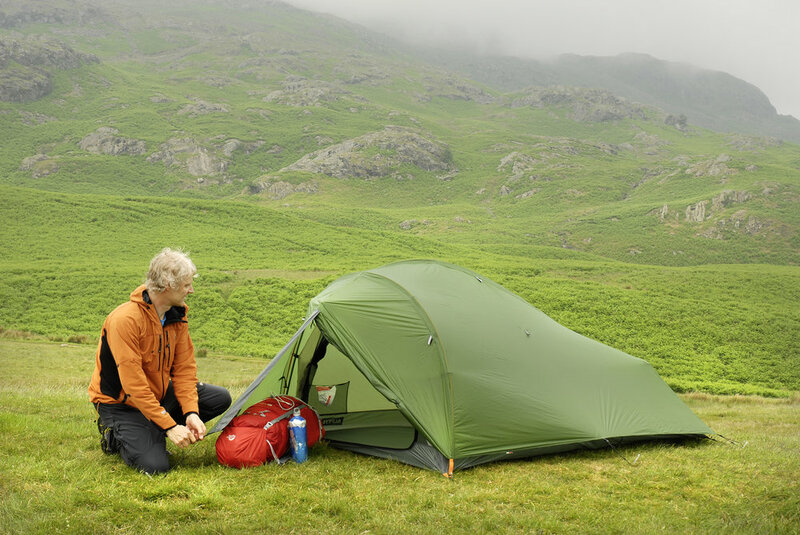 But the weight of 1335g is exceptional for the size, stability and features; and when we add in that price tag it is a stunning tent, all things considered. The Alpkit Ordos 2 sets new standards in performance for its price tag and weight, while further highlighting how selling direct to customers can make the outdoors more accessible to those who want great gear at more affordable prices.